Ordovizium, Baltoskandia, Stratigraphie, Geschiebe, neue Arten. Within more than 50 years the author has collected a vast number of trilobites originating from erratic boulders especially of limestones of Ordovician age. By keeping all fossils from each distinct boulder it was possible to classify nearly all species stratigraphically. 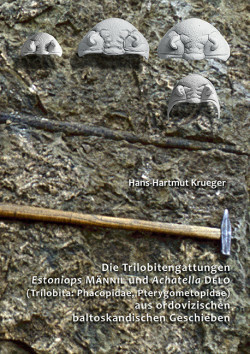 The fauna contains also represantatives of Estoniops Männil, 1958 and Achatella Delo, 1935 from the middle and upper Ordovician. In the present publication fossils belonging to eight species of trilobites of the genus Estoniops are dealt with. Of these, four species are described as new to science: Estoniops schuetti spec. nov., Estoniops mueritzensis spec. nov., Estoniops ruegensis spec. nov., and Estoniops uhakuensis spec. nov. The first species and E. panderi (Schmidt) are the only representatives from the upper Aseri stage CIaβ. Estoniops mueritzensis spec. nov. and E. ruegensis spec. nov. are additional members of this genus occuring in the Lasnamägi-stage CIb. Estoniops uhakuensis spec. nov. belongs to the Uhaku stage CIc and seems to be a transition "form" to Estoniops exilis (Eichwald). The few carapaces of Estoniops panderi show some variability in the morphology of the cephalon. Of the rarely recorded trilobite genus Achatella five species are introduced. Among these Achatella spec. A. from the Lasnamägi stage CIb is a very early representative for the fauna of Baltoscandia. On the other hand, Achatella (Vironiaspis) nabalaensis spec. nov. from the Ostseekalk of the Nabala stage FIa is the youngest representative of this genus. Ordovician, Baltoscandia, stratigraphy, erratic boulders, new species.